The National Environmental Policy Act (NEPA) ensures that the BLM considers the impact of an action on the quality of the human environment before decisions are made and the action is taken. NEPA-related documents are required to concentrate on significant issues. The NEPA process is intended to help public officials make better decisions based on an understanding of environmental consequences, and take actions that protect, restore, and enhance the quality of the human environment. The NEPA process is intended to help public officials make better decisions based on an understanding of environmental consequences, and take actions that protect, restore, and enhance the quality of the human environment. All of BLM's planning documents prior to October 2015, can be found in the Oregon/Washington NEPA document library. Documents can be searched by fiscal year, district, program area, and document type via the NEPA Archive Document Search. 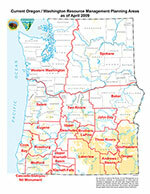 There are currently a number of significant ongoing planning efforts throughout Oregon/Washington. Additional information and supplemental materials can be found on the related planning pages.